Fiology thanks M.K. Williams, self-publishing expert of the FI community, and Mr. Winning Williams , the Budget Wizard of the FI community, for shaping this lesson. There is one critical lever to pull when you are trying to cut costs from your budget without giving up the things that you love. Books, television, movies, and music all usually go under the “entertainment” line-item in our budgets and that is usually the first one that is cut when we look to tighten our budget. Thankfully, you can access all of those items for free at your local library. Each library will be a little different, but the basic resources are fairly universal. When was the last time you visited your local library? Perhaps it is time to give it another look and see what you have been missing. Listen: WSIRN Ep 138: The Librarians Are In by Anne Bogel of modernmrsdarcy.com. What Should I Read Next provides excellent book recommendations. 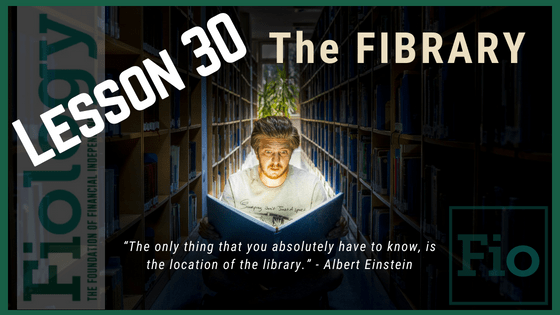 This episode features two librarians in the New York Public Library system. They discuss how the library has evolved and the resources that they want everyone to know more about. Take Action: Google your local library. Check out their website and the location that is closest to you. Get a library card if you don’t already have one. Go to the library and check out one book that you can read over the upcoming weeks and one movie that you have been waiting to watch. Visit Your Local Library – seriously it is the best resource for knowledge out there. For anything that you want to learn more about on any topic.